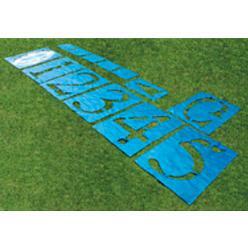 This football stencil kit with 6 foot numbers is made of ultra-durable corrugated plastic which can be washed and used over and over again. This football stencil kit has everything you need to paint G, 10, 20, 30, 40, 50, directional arrows, and hash marks. Includes set of 4 alignment poles and carrying bag.